With growing number of wedding tourists flying into Dubai, the demand of exotic wedding venues in Dubai has been increasing day by day. Getting married in Dubai is like converting fairy tales into realities. If you are looking for something traditional or resorts on tropical islands offering gorgeous wedding chapels or exotic gardens, you will find all such wedding venues in Dubai. This city is also famous for its beachside ceremonies, providing ultimate backdrop of white sand, Blue Ocean and stunning green islands. Whatever your preference is, you will find endless options for your perfect wedding in Dubai; let’s check out best wedding venues in Dubai. Surrounded by azure seas & decorated in opulent luxury, Atlantis, The Palm is one of the best wedding venues in Dubai. The dedicated wedding team of Atlantis, the Palm brings every possible service under the sun at your disposal on your special day. They have a number of indoor & outdoor venues for you to choose from, each totally unique and offering you a blank canvas to work from. Atlantis indoor venue, the Majestic Atlantis Ballroom has the capacity to accommodate up to 2,000 guests who have full access to the Royal Terrace with its spectacular views. Outdoor venues include expansive Pool area that can accommodate up to 2,000 guests near the Zero Entry Pool. For small scale weddings, the Palm-Fringed, an intimate Private Beach area is simply perfect for bare-foot brides, or you can opt for elevated Royal Terrace with its unforgettable views of the Dubai Marina. They have a team of dedicated wedding planners available to assist couples every step of the way. Our experts are on-hand to offer full wedding design, assistance with anything you need, and coordination services that include helping you choose the perfect venue, setting out your menu options, choosing flowers and those all-important wedding photographs. Atlantis, The Palm offers a variety of wedding packages suiting the style and requirements of every couple, ensuring that their reception party has everything they wanted. Among the great wedding venues in Dubai is the Armani Hotel.The most cosmopolitan of all the hotels and venues, the location and the dramatic backdrop created by the Burj Khalifa makes this truly one of the great destinations of the world. Those who want a modern style wedding, their ballroom offer the perfect setting. The pre-function area of Armani Hotel is an excellent cocktail area to hold your guests with celloist & violinist performing to entertain until all of them have arrived and do the “big” revealing of the ballroom. The Armani ballroom can accommodate up to 450 guests & offers a beautiful, elegant backlit resin walls and dark grey carpeting. The Armani Pavillon is a wonderful terrace situated at the foot of the Burj Khalifa. It can accommodate up to 1000 guests for a top notch dinner, cocktail reception or private gathering. This wedding venue in Dubai has its own separate kitchen facilities & the view is simply beyond words. While the guests enjoy dinner as a backdrop, they will have the iconic Dubai fountain that is among the most visited touristic destinations in the world. Guests can choose to have their own choice of song to be played at the fountain. The dancefloor, changing room for the bride, valet parking and beautiful wall decorations are complimentary. The 5 stars hotel food is prepared with the highest standards and offers a large diversity of dishes for the international guests. Located in Palm Oasis, Al Maha Desert Resort is another luxurious wedding venue in Dubai. It is a 5 star luxury hotel with an excellent outdoor desert venue for a wedding. It provides complete privacy to all its guests, the only resort located in the pristine Dubai Desert Conservation Reserve. The wonderful Al Maha Desert lies about 65 km East of Dubai & situated in a desert conservation reserve area. The desert forms a perfect romantic backdrop for any wedding. It’s 42 elegantly furnished Suites cater to the discerning travellers who seek an incomparable levels of service and authentic Arabian cultural experience. The classic Arabian décor & impressive style of Al Majlis makes it an ideal location for indoor celebrations of up to 120 guests, including pre-wedding drinks and canapés, or post-ceremony celebrations and banqueting. The seating and room layouts are designed to match your preferred style of event and to ensure the complete comfort of you and your guests. The staff of this wedding venue in Dubai can help you with any aspect of planning and designing your perfect wedding decorations, be it related to floral arrangements or logistics arrangements, or any additional requirements. Host a Desert Wedding with private access to a part of the Dubai Desert Conservation Reserve where you can enjoy an intimate wedding ceremony. Undoubtedly it’s an ideal place, if all you want a stunning destination wedding with a twist. The stunning oasis in the desert is just a magical spot for you to get married in Dubai or for your reception! With fire torches and candle bags to create that breathtaking back drop, getting married in Dubai has never been so romantic and sensous. This is a truly unique spot with natural materials, replicating heritage of this beautiful land. To proclaim your love for each other or to celebrate after, this unique wedding venue in Dubai has everything you wished when decided to get married in Dubai. Another wedding venue in Dubai offering unique & inspiring settings, the club is the perfect venue for your wedding, second to none in Dubai. Experience a day of romance & celebration in the most breath-taking surroundings you would have ever imagined. Their dedicated lifestyle Events Team makes the planning process as much a pleasure as your dream day. Arrive by romantic horse-drawn carriage & soak up the wonder in the knowledge that your fairy tale wedding will unfold exquisitely from beginning to end. Dubai Polo & Equestrian club is located opposite Arabian Ranches next to Studio City, having the capacity to accommodate from small gatherings upto 1000 guests, at the beautiful outdoor venue, Polo Field. It is completely a unique wedding venue in Dubai with a feel more like a country club having stabbings and large polo fields. This lovely venue has tons of green space & can cope up with the largest outdoor weddings. The polo Club has at least 3 different wedding options, of which particularly love the Saha Courtyard with its fountains and lovely intimate feel. It is one of the most iconic 5 star wedding venues in Dubai; the Ritz Carlton is synonymous with elegance & quality. With 9 restaurants & lounges, there is no shortage of places for you & your guests to chill out. The wedding Pavilion area is large expanse of grass backing onto views of the Gulf. The sunbird lawn area is surrounded by beautiful trees with views of the hotel & amazing skyline. Nestled along Jumeirah Beach Residence’ The Walk, Dubai’s exclusive promenade reminiscent of the French Riviera, lies an intimate beachfront retreat. The resort low-rise, Mediterranean façade with its sweeping driveway, rose-petal strewn fountains & stunning Mashrabiya woodcarvings, provides a dazzling vision of tradition enveloped in an elegant modern setting, amidst the towering skycrappers of Dubai’s cosmopolitan Marina. Indoor celebrations take place among the timeless charm and sophistication of the newly designed Loulou’A Ballroom. While a choice of outdoor venues set among the resort’s lush landscaped gardens, with views of turquoise waters & sandy shores of the Arabian Gulf, provide an idyllic backdrop for al Fresco weddings. Positioned in the heart of the city, Crowne Plaza is an ideal wedding venue in Dubai you have dreamed all of your life for a perfect marriage. As a distinctive venue, Crowne Plaza takes care of all the little details to ensure your big day is unique. While the chefs create a bespoke menu specifically tailored to your taste, the additional offerings as floral design services, entertainment, photography & more is well taken care of. Featuring a host of fitness and wellness options, fine dining restaurants, lounges, business services and other miscellaneous amenities as childcare services, housekeeping etc, Crowne Plaza Dubai can prove to be best partner in coordinating every detail of marriage in a most stylish, yet in a practical way. Crowne Plaza Dubai is a perfect wedding venue in Dubai to organize any other small functions associated with venue. Make yourself comfortable & enjoy your private retreat while the experts take care of the rest! Blessed by Dubai’s spectacular skyline, JW Marriott Hotel Dubai offers elegant & romantic spaces. From intimate gatherings to a grand cocktail reception for up to 1,000 guests, they offer ultimate luxury & hospitality. While the spectacular ballroom is dressed to perfection, it is also the colorful, modern look that makes the place look gorgeously splendid. Offering unparalleled romance, luxury and hospitality, the elegant wedding venue in Dubai serves as a wonderful backdrop for wedding rituals and traditions. You can also explore outdoor venues, including the pool deck, for a truly sophisticated wedding or event. For intimate weddings or rehearsal dinners, you can also find smaller spaces in this wedding venue in Dubai. Hotel’s talented on-site planning team can help you assist with everything from room décor to catering. Your wedding guests will be delighted with luxurious accommodation and prime downtown location. Having 1.5 km of private white sandy beach, Hilton Ras Al Khaimah Resort & Spa is the perfect wedding venue in Dubai. The resort offers several setup and location options for the ceremony and reception. The dedicated Events team of Hilton Team has extensive experience organizing Indian, Arabic, & Western weddings of all sizes and will help turn your wedding dreams into reality. Hilton Ras Al Khaimah Resort & Spa provides wedding packages with everything needed for a spectacular wedding. The wedding packages include options for a live band or a DJ, or choose an elegant car or horseback for the grand entrance. Venue choices include watersports beach, adult pool and the waterbreaker, which boasts an amazing sunset view. This wedding venue in Dubai offers 2,000 sq. m. of spa facilities ready to welcome the bride, groom, bridal party, and Guests for the ultimate experience in relaxation. Accommodations include guest rooms, villas and suites. One & Only Mirage, another awesome wedding venue in Dubai is located in the heart of New Dubai overlooking Palm Island Bay. It is considered as Dubai’s most stylish beach resort, paying tribute to Arabian architecture & hospitality on a truly regal scale. The resort is having three equally distinctive properties – Arabian Court, The Palace and Residence & Spa: Each one offering its own collection of unique venues, making it the perfect setting for any event. It’s a magnificent wedding venue in Dubai of authentic character. Al Koufa Fortress can be taken in its totality or can be segregated into 3, with the fortress hosting 100, lawned gardens 200 & amphitheatre hosting 350. At this place, floor to ceiling windows are kept opened onto a private courtyard. Natural daylight keeps on pouring over the interiors of a distinctive Moorish accent. It’s a majestic Arabesque setting. The ballroom can be divided into 3 sections; each with a draw down screen. The private entrances are large enough to drive in cars. This is a charming Arabic setting featuring majlis seating with floor cushions around low tables. The Palace Gardens and Esplanade is landscaped around a lengthy narrow water feature with an enchanting setting for private dining having myriad candles. PromoEvents, one of the premier wedding event companies in Dubai understands the expectations that you have of not only the nuptial vows but also the associated celebrations. They help you create a fairy tale wedding that will become the talk of your family and friends for years to come. From meticulous searching of the theme, to venue selection to guest hospitality, entertainment, travel and stay, technical production, gourmet food selection, flower arrangements and to hosting the various wedding galas, we will ensure smooth and flawless execution. The wedding day is one of the most memorable days of our lives and everyone wants to celebrate in his/her own way. In the past few years, marriage trends have taken a quantum leap. Today’s brides & grooms think beyond routine venues. They desire to plan in a more offbeat & fashionable style. For them, Dubai for Destination Weddings is best decision they can ever take. A destination wedding is an opportunity for couples to celebrate their marriage at a gorgeous destination with versatility in venue, decor & dining. Surprisingly, all this at reasonable price. Destination wedding cuts down the guest list to the closed ones, you get a scope to stay away from gossiping aunts or meddling cousins at best day of your life. Youngsters dream to rejoice this important day in the most romantic city of Middle East – Dubai? Whether you are planning a huge gathering with friends & family or want to keep it as a personal affair, Dubai offers spectacular wedding locations. Dubai for Destination Wedding is a great decision. You will be spoilt for choices with a range of indoor and outdoor venues from sun-kissed beach, to an exceptional resort set in the heart of the desert making your wedding once in a lifetime celebration. You can plan your destination wedding at Al Maha Desert Resort. It is a great place if you have ever dreamt of getting married in the middle of an Arabian Adventure. Another desert location is Bedouin Oasis Camp, that’s a magical spot for you to get married in Dubai for your wedding reception! It is famous for fire torches and candle bags to create a breathtaking back drop. With access to a beautiful Bedouin Camp, this is a truly unique spot using natural materials replicating the heritage of this beautiful land. You can also find innumerable exotic resorts like Radisson Blu, Hilton Fujairah Resort, Fujairah Rotana Resort & Spa, Marjan Resort & Spa, Cove Rotana Resort, Danat Al Ain Resort Hotel and Asfar Resorts at famous places –Fujairah, Ras Al Khaimah & Al Ain, all having good guest hospitality, thematic décor, food & a great atmosphere to enjoy your wedding in the most relaxed way. At Dubai, you can definitely make your dream beach wedding a reality with Kempinski Hotel & Residences Palm Jumeirah. The five-star hotel on the Palm Jumeirah has a secluded setting with exceptional views of the Dubai skyline, Arabian Sea, and seascape. With so many picturesque backdrops, such as the luscious green gardens and a dramatic staircase for that spectacular first entrance, the hotel can truly take your special day to another level. You can make wedding arrangements in one of 244 luxurious suites, villas and penthouses. Beaches & Deserts are the best places to organize your wedding, especially between October to May. However, in summer months, one can plan in luxury hotels like Dubai Polo & Equestrain Club, The Address Montgomerie Dubai, Bab Al Shams, Atlantis The Palm Hotel, The Crowne Plaza, Conrad Dubai etc. Dubai is beautiful! From city to beach, garden to desert, you can get creative with your pre-wedding and wedding shots here. So, you must not at all hesitate to choose Dubai for destination wedding. Dubai culture is global in nature because of heavy expatriate population; hence Dubai for Destination Weddings is the best decision to take. Dubai, a multicultural city is host to many religions and different type of nationalities. The official religion in Dubai is Islam. However, because of presence of other foreign cultures, other religions are also practiced in the Emirate. You will find Muslim, Christian, Hindu, Sikh, Buddhist, Zoroastrian, Jewish & other religious backgrounds people in Dubai. There are religious establishments like Church, Mosques or Temples and people are allowed to practice their religion at their respective religious places. During your destination weddings, you can also invite a prayer leader to your wedding venue. In Dubai, there is no issue at arranging any sort of marriage be it Hindu, Sikh, Muslim etc. Dubai catering services offer Special Dubai Food, apart from other famous International cuisines like: Iranian, Asian, European and Indian. It may cost you to hire more than one catering company as professionals but yes, you may have all kinds of cuisine options with the best quality choices in Dubai. Having a multi cultural population and abundant agricultural structure, Dubai offers you variety of global gourmet catering services in best quality very easily. Falafal – Mashed peas and sesame seeds rolled into chicken balls & deep fried. Shawarma – It’s a traditional Middle Eastern snack. It is made of grilled shavings of chicken or lamb, mixed with salad & then rolled inside Arabic bread. If you have selected Dubai for Destination Wedding, then this is one of the most popular Dubai foods during festive time that comes from the local kitchen and involves a lengthy preparation. It is mainly made from meat & wheat and is a must-have for destination weddings in Dubai. The Iranian cuisine has a touch of the Persian flavor in most of its dishes. Spicy rice is one of the major highlights of Iranian cuisine. Usually, Iranian dishes are served with cabbage, lettuce, onion, tomato and minty yogurt sauce. Dubai’s population includes a large chunk of the Asian population. Anyone coming to Dubai for destination weddings & look for traditional food delicacies from Asian sub-continent is certainly never let-down by what Dubai has to offer in Asian cuisine. Awadhi, Punjabi, Sindhi, Mughlai and Pashtuni cuisines are some of the variants of Asian cuisine that are in huge demand by one and all. Dubai is a place thronged by its visiting western population & that’s why European cuisine is one of the most asked dishes at the time of weddings. There is a huge demand of European and American cuisine in Dubai. Like its Asian counterparts, meat is a popular element in most of its dishes like Pizzas, Pasta, Fried Scampi, lambs, beefs, etc. If you have chosen Dubai for destination weddings & you are are willing to do wedding arrangements at an outdoor venue, then Dubai wedding planners can easily arrange buffet services as well. Buffets are very popular as they are both cost effective and offer an informal atmosphere. Alcohol is costly in Dubai, so you can speak to the venue regarding the drinks packages they have on offer. Most venues will give you a certain amount of hours all inclusive for a set amount. One must choose Dubai for Destination Weddings as it is worldwide famous for its luxurious, exhilarating & remarkable destinations. It has memorable options for honeymooners looking to indulge, unwind and enjoy newly-wedded bliss. From palatial spa suites to high-end desert safaris, one can experience an unforgettable honeymoon in Dubai. It’s a fast-paced cosmopolitan city with oodles of glamour, glitz & excitement around every corner. A honeymoon in Dubai is a wonderful way to begin married life. Book a Dhow Cruise: There is nothing like having a buffet dinner with international cuisine on the cruise while admiring the skyline of Dubai. The dhow cruise dinner is surely a perfect idea of spending relaxed evening with your loved one. Enjoy a Hot Air Balloon Ride: There is no better way to celebrate your romantic moments than with an amazing magi carpet ride over an endless ocean of sand dunes, emerald green oases, oryx, gazelles and wandering camels. Dubai honeymoon things to do. Visit Burj Al Arab: Spending an evening dinner at the world’s most luxurious 7 star hotel may prove to be a pricey affair; however a restaurant booking at Burj Al Arab is worth every penny when it comes to surprising your partner with an enchanting experience. Indulge in best spa experience: The best hotels in Dubai for memorable spa experiences include Burj Al Arab, Atlantis the Palm, Hilton Dubai Jumeirah, and the Ritz– Carlton. People choose Dubai for Destination weddings as it is easily accessible by all major airlines & the expanded services of Emirates Airline alone connect more than 150 destinations across six continents. From India, Dubai is approximately 3 hours, 15 minutes far and around 12 direct flights services are available on a daily basis. Similarly from Jordan also, it is approximately 3 hours, 15 minutes far, 9 direct flights are available on a daily basis. Non-stop flight time from Dubai to New York is around 14 hours 45 minutes. However, some airlines could take as long as 44 hours based on the stopover destination and waiting duration. This is the average non-stop flight time from Dubai to either of the major airports that serve New York. Non-stop flight time from Dubai to Frankfurt is around 7 hours 15 minutes. Fastest one-stop flight between Frankfurt and Dubai takes close to 9 hours. However, some airlines could take as long as 33 hours based on the stopover destination and waiting duration. This shows proximity to reach Dubai from any continent is not that much long. Most destination weddings follow traditions of their own country. However, you can easily bring in an Arabic flavor if you want to honor Dubai’s rich culture. Such touches include having Arabic cuisine for your food, or hiring a belly dancer, or an Arabic music session. Youngsters must choose Dubai for Destination Weddings as there are many talented musicians & reputable entertainment agencies in Dubai like Vento Entertainment, Bareface Entertainment, Wow Entertainers, GEM Entertainers etc. These agencies supply musicians, bands and alternative entertainment, such as fire dancers, magicians and caricaturists of all budgets and nationalities. Dubai’s outstanding musicians perform Jazz or funky house music with DJs. Musicians perform live on the most special day of your life playing orchestras, bands, electric violin with different themes and occasions . Here, you can also book a saxophonist to bring most romantic feel in your wedding event. Dubai is full of entertainment performers like Stilt Walker, Balloon Bender, Mascots, Acrobats etc. bringing much required spark in your wedding. Wedding shopping in Dubai is a dream come true for “Shopaholics”. There is nothing related to your wedding shopping that you can’t find in Dubai malls. You can also shop from Dubai famous bridal shops. Choosing Dubai for Destination Weddings is the best move on can take. The city has a lot of bridal shops have quality items, and they encourage bride-to-be to try their favorite gowns on. You can expect to be given a lot of help to get into the dress. This is essential as many of these glamorous dresses have multiple layers, boning, zips or buttons and really are a two person job to fit. You can also find Indian Bridal Lehenga in places like: Studio 8 having labels of Manish Malhotra on Jumeirah Beach Road, Designer’s lounge at Bur Dubai, Sanams at Meena Bazar. The Gold & Diamond Park in Dubai is one place having all designs you could ever think of for your engagement and wedding rings under one roof. It’s on Sheikh Zayed Road. Dubai is also popular for wedding make-up artists. Some of the best ones are Natasha’s , Monira Alshayikh – She is Winner of International Arabic gulf make up award. Lina Waled is also one of the top hair & makeup artists in Dubai worked on TV commercials, movies, fashion shows. Undertaking a destination wedding requires careful and meticulous planning- something that a wedding planner is best suited to do. When you choose Dubai for destination wedding, you must look for a local wedding planner who understands not just the intricacies of Indian weddings but also a strong hand in executing things locally. Promo Events is one such local Dubai based Wedding and Event Management firm that has been helping hundreds of couples plan their destination wedding in Dubai. If you are organizing your wedding event at night, then you can create grandeur of your big day by choosing right sound, lighting and AV technology. In Dubai, world’s latest technology is available like Pyrotechnics, Lasers, Air, Foam, Holograms etc. You can choose to create wind and air effects with fans and blowers that use compressed air to make your show even better. You can also create fog effects with water mist, smoke effects, dry ice, liquid CO2 fog and others. You can also involve moving elements and automation styles at your wedding day. These include moving screens, curtains, covers and many others. For projection, you can include trendy LED screens, multimedia projectors and laser holograms. LED screens are scalable and can be installed at various places. Multimedia projectors are used not only for mapping but on all screens. Dubai event planners use OLED bending displays. You can also try hiring confetti producers. Confetti comes in all shapes, sizes and colors and you can use them to create a joyful and cheerful atmosphere, especially if you spray them around the audience. There are also state pyrotechnics, flash pots, flame shooters, gerbs, waterfalls, airburst, and, of course, you can also hire a flame artist to do his magic. Undoubtedly, choosing Dubai for Destination Wedding is the best decision you can take in your life. Promo Events can help you arrange your dream wedding at the beautiful landscapes of the beach or the mountains adding romance and beauty. From the most exotic locations to the most innovative ones, they find the right destination that best fits your style and budget. New tourist attractions in Dubai are constantly emerging for conference delegates to visit. It began with the most luxurious hotel – The Burj Al Arab, then a palm-shaped artificial peninsula; then a world famous tallest building on the planet –The Burj Khalifa and now new attractions from aesthetic parks to stunning buildings have topped the list. MICE planners must include this new tourist attractions in Dubai for conference delegates to visit. Inaugurated on 9 November 2016, the 3 km canal originating in Business Bay passes through Safa Park and Jumeirah, culminating in the Arabian Gulf. The project has created 80,000 square meters of new facilities with private marinas for boats, and also hosts a shopping centre, four hotels, 450 restaurants, walkways and cycle paths. The full length of the canal has got five pedestrian bridges, three of which connect either side of the canal with unique aesthetic specifications. The three bridges rise 8.5 meters above the water. The first two bridges are destined between Shaikh Zayed Road & Al Wasl Roads, and the third bridge is located in the area between Al Wasl and Jumeirah Roads. More than 4,600 labors were employed to build the canal under the supervision of four main contractors and 60 subcontractors. It was split into five contracts due to the massive scope of the Dubai project. Another source of tourist attractions in Dubai that can be shown to your conference delegates is Dubai Opera House. It is 2000-seated, multi-formatted, performing arts centre, located within The Opera District in Downtown Dubai. It was developed by Emaar Properties to host a variety of events and performances including theatre, opera, ballet, orchestra, films, sports events, concerts, conferences and exhibitions. The plan about this new tourist attraction in Dubai was announced by Sheikh Mohammed bin Rashid Al Maktoum in March 2012 and the project got completed in 2016. It was opened on 31 August 2016 with a performance by Plácido Domingo. The stunning dhow-shaped building of Dubai Opera is a masterpiece of contemporary design & a stylish tribute to Dubai’s maritime history. Architect by Janus Rostock, the building’s exquisite design provides the exceptional ability to transform into 3 modes; from a theatre into a concert hall, and into a ‘flat floor’ mode becoming a banquet or event hall. The building’s unique architecture allows you to host a variety of events such as trade shows, weddings, art galleries, exhibitions, receptions and parties, using its “flat floor” mode that are usually enjoyed by conference delegates. Dubai Opera also boasts a number of spaces and venues, including a stunning rooftop restaurant and sky garden with views of The Dubai Fountain and the world’s tallest building, Burj Khalifa. MICE event companies do take their conference delegates to this place as it flaunts cutting-edge architecture with the brand’s modern signature, tribal influences, all white decor and stylish ambiance. Nikki Beach Dubai pampers its guests with extravagant & plush sun beds. Its unique menu is filled with lavish parties, flavorful food, exceptional entertainment and stunning waterfront views of the Arabian Gulf. Nikki Beach Dubai offers globally-inspired cuisine, with the tastes & spices representative of all the countries. Nikki Beach is located worldwide, famous for its creative sushi rolls, delicious salads, original seafood entrees and slow-roasted free-range rotisserie chicken. Conference delegates enjoy Nikki Beach hospitality from day to night. Other facilities include swim-up bar, & 4-tier VIP terrace, enclosed and open cabanas, ultimate VIP cabanas, an oversized leisure pool, among other amenities. That’s why this new tourist attraction in Dubai is throbbing heart of all the conference delegates visiting this beautiful place. Nikki Beach Resort & Spa Dubai is located on the waterfront of Pearl Jumeirah, allowing visitors to enjoy the Arabian Gulf’s blue waters & stunning panoramic views from almost every corner of the property. This resort is ideal for attracting tourists, just 14Km from Dubai International Airport and 7Km from Downtown Dubai. Marina 101 Tower completed on November 2016 is a 101 storey, it’s 426.5 m (1,399 ft) tall skyscraper, currently topped out in Dubai Marina, Dubai, United Arab Emirates. Marina 101 stands at over 80% completed. The construction is done by Turkish conglomerate TAV Construction and the building is designed by National Engineering Bureau. Marina 101 provides complete sea views from the 94th floor upwards. Among all the towers, Marina 101 is one of the most popular new tourist attractions in Dubai after second tallest tower Burj Khalifa to show conference delegates. The first 33 floors of Marina Tower will have a 5-star Hard Rock hotel having 281 rooms, while the floors from 34 to 100 will have residential apartments. There will be 252 one-, 204 two-, and 42 three-bedroom apartments with 6 duplex penthouses from the 97th to the 100th floor. The 101st floor of the skyscraper will feature a restaurant, lub lounge and a Rock Shop merchandise store. Bollywood Parks Dubai is the first park of its kind on this planet. For the first time ever, you will live, learn & experience the kaleidoscopic world of Mumbai’s famous film industry, in the world’s first Bollywood themed park covering 1.7million square feet. Being one of the new tourist attractions in Dubai it has five fascinating zones of Bollywood Park, you can experience different environments inspired by the greatest Bollywood blockbusters. Here conference delegates can enjoy flamboyant cinematic rides, live entertainment & stage performances unlike any other. You can have an experience of strolling at Mumbai streets with its famous food, shopping and party spirit. To add some thrill; you can also join the mafia boss Don on a chase through the streets of Dubai. At this place, the spirit of rural India comes to life in a picturesque setting. Be part of never-ending adventures as played out in Dabangg, Lagaan and Sholay. The central attraction of Royal Plaza is the Rajmahal theatre, conference delegates can experience visual splendor like never before. This new tourist attraction in Dubai is a home of the region’s first Broadway-style Bollywood musical. Lose yourself in an enthralling choice of entertainment, street-style food carts, cafes, shopping designed to dazzle and awe you. Learn how to create a blockbuster like Zindagi Na Milegi Dobara, and meet your favourite Bollywood superheroes, such as Krrish and RA.One at the exciting Bollywood theme park. This new tourist attraction in Dubai is all about action, adventure, romance, comedy, music, dance, emotion all in Bollywood style. Conference delegates enjoy here a lot. Another part of tourist attractions in Dubai to show conference delegates is Palm Jumeirah Boardwalk. It is one of the shimmering examples of how innovative engineering & creative thinking can be executed to bring more facilities and attractions to Palm Jumeirah. This unique destination is one of a series of new projects under way on the island. It provides a popular spot for jogging, walking and sightseeing among both residents and tourists. The Palm Jumeirah Boardwalk is an eleven kilometer walkway stretching across the outer crescent of The Palm, all the way from the Rixos Hotel on one side to the One & Only Hotel on the other. The Boardwalk is six meters wide, however cyclists aren’t allowed. The Boardwalk is just for pedestrians. This new tourist attractions in Dubai for your conference delegates is accessible through 37 different gates, and will eventually come to be lined with cafes, kiosks and food trucks. The Palm Jumeirah Boardwalk is a shining example of how we use creative thinking & innovative engineering. Dubai Festival City Mall – A new tourist attractions in Dubai includes new 420 stores and all new festival squares that serve as the mall’s new main atrium and 185000 square feet H&M store. This new tourist attraction in Dubai also includes redesigning & landscaping of the 300-meter long waterfront promenade and the launch of a new 3500 square meters food court offering 24 restaurants with a combined capacity of over 2,000 seats and featuring Dubai’s only free supervised play area for children. The restaurants at this mall expansion will comprise of Dubai’s first serendipity 3 as well as c-house, texas road house, cheese cake factory, eataly, fratelli la bufala, sugar factory and al fanar. Undoubtedly, Dubai Festival City Mall Expansion is one such tourist attraction in Dubai that needs to be in must visit list of MICE planners to show conference delegates. Dubai is already home to the biggest shopping malls, world’s tallest building & largest man-made islands. Now, it is claiming another new tourist attraction in Dubai – the “World’s Largest Indoor Theme Park” for conference delegates to visit. IMG Worlds of Adventure, an amusement park took three years to build & costs more than $1 billion dollars. This place is must one in the list of Dubai MICE planners because this park is as large as 28 football fields, measuring some 1.5 million square feet in size. The Dh6-billion Bluewaters Island will be one of the largest tourist hotspots in the world and is being built near Jumeirah Beach Residence. The Bluewaters island is soon to attract more than three million visitors per annum. Dubai Eye, now named as Ain Dubai Ferris Wheel will be the world’s tallest Ferris wheel. Once completed, Ain Dubai will emerge as an engineering masterpiece, the first of its kind in the industry, & a truly spectacular must-visit attraction, adding a unique experience to the list of top new tourist attractions in Dubai to show conference delegates. 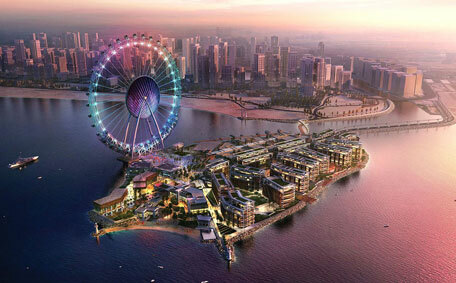 Ain Dubai, previously known as Dubai-I, is set to become the main attraction of Bluewaters Island, which will also feature entertainment, retail, residential and hospitality offerings. Dubai Frame is a new tourist attraction in Dubai titled by Fernando Donis. The design was selected as the winner of the 2009 ThyssenKrupp Elevator International Award from among 926 proposals. Participants from all over the world were invited to submit an emblem that would promote “the new face for Dubai”. Dubai Municipality’s Director General Hussain Lootah reported Gulf news on May 18 2017 that the massive 150 meter-high, 193 meter-long project was expected to open in October 2017. As of 2017, the architect and the Municipality of Dubai has got engaged in a legal dispute over ownership of the copyright for the building, hence the project got delayed. Dubai Frame is located in such a manner that landmarks of modern Dubai can be seen on one side, while from the other side, visitors can view older parts of the city. The iconic structure will be set to shine in its golden cladding. This new tourist attraction in Dubai is expected to attract 2 million visitors a year & a lot of them would be conference delegates. Dubai Frame will join the long list of internationally recognized landmarks, such as the world’s tallest building Burj Khalifa and the famous Seven – Star hotel Burj Al Arab. The 119-hectare park is divided into three separate zones – African, Arabic and Safari. The animals that are raised here were resourced responsibly from zoos across the world and also include rescued animals. Lions, bears, monkeys, bats and South East Asian elephants have already arrived at the zoo, which is being built on top of a landfill site. Approximately 1,000 animals from around the world will get a home in the Dubai Safari Park, and out of those, there will be more than 350 species of rare & endangered animals. If you are looking for a comprehensive safari adventure, then this is the real deal. Every MICE conference manger is waiting for its completion as this going to be one of the most enchanting new tourist attractions in Dubai, every conference delegate would love to visit. Sheikh Hamdan bin Mohammed bin Rashid Al Maktoum, Chairman of Dubai Executive Council also Chairman of the Board of Trustees of Museum of the Future and Crown Prince of Dubai, has issued order for quick implementation of the work plan for the museum as it plays an important role as a source of inspiration for innovations and an incubator for ideas. Museum of the Future is located in the Emirates Towers area, that’s near Sheikh Zayed Road. This new tourist attraction in Dubai will be completed by the end of 2017. Conference delegates will be experiencing the future through cutting-edge simulations & interactive demonstrations at this innovative place. Dubai has become leading destination for conference delegates. In this multicultural city, there are multitude talented MICE event planners; one of them is Promo Events, offering professional MICE services with numerous attractive locations and event venues for exclusive groups. Every group size is assisted with travel services, including transportation and accommodation. Being an experienced event management company, we offer you full advantage of our extensive knowledge, expertise and resources. Hiring an event management company for your next MICE conference could end up saving you several days of stress! MICE tourism is nothing but business tourism. MICE tourism presents ultimate opportunities for business development, whether it’s an informal conversation with old partners, meetings with prospective investors, introduction to new technologies or information exchange. Fabulous locations are most important to consider during MICE planning than anything else. By hiring one of the best event management companies for MICE, you get better choices of locations to conduct MICE meetings while you might just have idea of 2-3 locations. Event management companies understand your purpose behind conducting MICE tour i.e. whether you want to organize corporate conferences for extended period of days or the trip is planned as a reward or training for employees or want to organize cultural & sporting events, trade shows & exhibitions. After understanding the broader purpose of conference, further they analyze the theme & topic on which your well-planned agenda is centered. Then, finally important details like venues, potential experiences, off-site excursions and memorable dining possibilities are decided. For example: If you are planning a conference, seminar, staff incentive program or want to participate in an exhibition, then Dubai can be your best MICE location. However, if you are willing to pamper your employees with best tourism incentives, then you can definitely think of India, from the icy Himalayas to the tropical islands and from barren deserts to desolate jungles it is a world in itself. India is also popular for yoga & ayurvedic centers, health club & herbal spa facilities. Planning a tour by own can be bit expensive, particularly if yours is a large group. Generally the company managers are not aware of prevailing rates in terms of hotels, logistics, sightseeing etc. while event management specialists do this on a daily basis, they have good contacts and that’s why can suggest destinations within your budget. They possess good negotiable skills and therefore can manage the MICE tour smartly, you will be saved from the arrangement headaches and can concentrate on other important things. Promo Events offer customized MICE tourism at a budget most suitable to you whether you are planning for a tourism event in your own country, Dubai, India or any other peninsular country like Singapore. Generally, MICE tourism is meant to incentivize more than to educate employees or do serious business talks. Booking the right hotel is important in such a a scenario, you must hire an event management company for MICE tour planning. They understand your purpose behind meet, the number of attendees and ofcourse the budget, the event management companies book the resorts/hotels in advance and ensure that when the team arrives no time is wasted in doing formalities & they rather move towards their respective rooms peacefully and start getting the vibes of upcoming fun. Hiring an event management company is important for your MICE because it can plan food arrangement systematically as per attendee’s choice. They inform venue people about the choices of people, how many are non-vegetarian, eggitarian or pure vegetarian. How many take drinks, also categorically what drinks. What’s the choice of food – Chinese, South Indian, North Indian, Thai, Continental, Japanese etc. The MICE planners set the menu for each day with variety, handling by own becomes a tedious task. An event management company helps you in managing logistics for your upcoming tourism. It arranges transportation facilities like picking you from airports, dropping you to the conference/event venues, taking you to other sightseeing locations. They are expert in understanding traffic flow of the decided city and hence make route planning effectively. They ensure that only those bus/taxi vendors should be hired that have satisfactory safety records, meet federal & state operational requirements. You must hire an event management company for MICE tourism as it also helps you in negotiating best rate on your behalf. Coordinating with local authorities for necessary permits, requesting police assistance for special events, and understanding local laws that may have an impact, are being taken care by Event management companies. A good event management company offers One-stop shopping for all types of transportation, from shuttles and airport transfers to special event and VIP transportation. Delegate experience is the crucial part of any MICE tourism. Event management companies make arrangements by anticipating general & specific needs of the intended audience during complete tour. They help in arranging special amenities for elderly people and physically challenged people as well. By hiring event management companies for MICE, you can think of arranging emotionally intelligent events spaces such as recreational rooms, sensory lounges and experience zones facilitating greater partnerships. Event management companies can create all possible arrangements including rooms with movable partitions and furniture, or extensions onto a rooftop venue gardens, rooms with views, or an entirely out-of-the-ordinary locale. A conference is meant to take delegates outside of their regular office routines, that’s what event management companies take care of. They provide clients a healthy menu options, mineral water, access to gyms, yoga classes and fresh outdoor air. Guests should be able to select activities, talks, meetings, and spa sessions in advance to customize their ultimate conference experience and create the journey that suits each individual. Promo Events MICE planning is done in such a way that can boost work-life equilibrium and make a distinct mark in the industry. At Promo Events UAE., we have handled some of the largest MICE and Tourism events and have executed them to perfection. Organizing conferences in a different city is not an easy task. There are many things that are too difficult to be managed by own. In such situations, event management companies play a great role. Event Management Companies offer complete event planning services that can be customized to fit your needs and budget. Specialized event organizers have decades of experience in handling all the details that make your event memorable and seem effortless to your guests! From registration management to A/V equipment & support, a specialized event management company can manage all. Event planning experts work closely with the client to design an event that reflects the client’s vision of the gathering and meets the event’s objective. Clients hire event planners to plan all aspects of the event, including related details and action items, and to see that event go through in a hassle-free manner until its completion. By hiring event management companies for MICE, you can create informal areas with comfortable, even movable, seating or simply take the weight off your feet while you enjoy your takeaway coffee. Instead of the usual, theatre-style seating and the often uncomfortable, venue-supplied furniture, conference planners can bring in clustered seating, or even sofas. Event management companies have huge experience in arranging MICE tourism for various clients belonging to different industries in different cities. This results in maintaining good networks with local people. They easily understand their lifestyle, common slangs, culture and mindset. That’s why hiring an event management company for MICE is definitely a wise move as that can work as the best local partner for you. With event management companies, your MICE tour is planned smoothly, saving your precious time, money & avoid any frustration creeping in between of MICE tour. When you plan a MICE tour, it’s not only conferences or conventions for which you take your guests to a different destination, but it’s also about taking your guests for sightseeing everyday just after finishing up conferences or conventions. An event management company create a list of all the tourist destinations to be covered on a daily basis. They do prior research before taking the guests to the destination, they note the timings of different places, make prior bookings, update about the specific clothing to be worn for specific places. For ex: In Dubai, if you are planning to go Jumeirah Mosque, then the hands of ladies must be covered fully. Promo Events arrange complete sightseeing requirement professionally, they have been successfully doing this as a chore and have won trust of many high profile clients. Their extensive sitesseing planning has won us many accolades from clients world over. Event Specialists also arrange photographers during the complete tour. Photographers take images from conferences to sightseeing to hotel chilling. Later on, the photographs can be used for business purpose. Event planners make sure that copies of all the photographs are sent to all the guests once the tour gets finished to treasure the memory of an awesome trip forever. These days Dubai is considered as an ultimate destination for planning MICE. It is a unique destination combining variety of first-class hotels, excellent infrastructure, shopping, dining and entertainment facilities. This vivacious city brings together the highest standards of comfort and convenience with the traditional adventure of Arabia. From vast deserts to the towering skyscrapers and to the bustling souls, Dubai is an ideal location for any business event. Exhibition design is the process of conveying information through visual storytelling & environment. Your exhibition presence must appeal to event attendees and deliver all-important ROI. If you are planning to set up your next exhibition stand in Dubai, get acquainted with current exhibition design trends in Dubai. Dubai is one of the famous cities of United Arab Emirates having people from different countries. Many exhibition events are held in Dubai for different purposes. Most of the exhibitions are held at Dubai World Trade Center. It is one of the largest exhibition venues worldwide offering every type of service & support under one roof. With over 30 years experience & more than one million square feet of multi-purpose space, DWTC welcomes some of the world’s most high-profile exhibitions. This is the best place to explore Exhibition Design Trends of Dubai. 3D printed exhibition stand is one of the famous exhibition design trends in Dubai. 3D printers can print anything from a supercar to an artificial limb. This is a trend that the trade shows and exhibition industry is taking seriously as the technology required to print large scale 3D structures from a multitude of materials is becoming more and more accessible and more and more affordable. Recently, 3D Printing was the focus of 2017 Arab Health Exhibition & Congress held from 30 January 2017 to 2nd February 2017. It is the largest healthcare tradeshow in the MENA region and the second largest in the world offering the perfect opportunity to share innovation, technology, development and new ideas at one place. Natural looking materials are new exhibition design trends in Dubai. When used properly, a combination of smooth & rough textures add depth. Many trade show exhibitors in Dubai are using textured surfaces in their exhibition booth stand to increase visual interest. Textured surfaces draw attention; add depth & richness to exhibit’s look and feel. And unlike Zolatone, the spray finish gives exhibitory a faux-stone look that exhibitors have been using from the past many years. Promo Events , one of the premier exhibition agencies in Dubai offers world class exhibition solutions by using originality and unique ideas to design booths and pavilion interiors. The interiors they do for pavilions immediately create a sense of identity. Box designs can be round, rectangular, oval or whatever shape you want & can fit into your exhibition space. The advantage of the box design is that it allows one to use the entire space allocated to your stand and define the space with walls, unlike traditional exhibition booths. Various exhibition stand contractors in Dubai are slowly moving away from Round pole system and are opting for the more robust square profile system. This is one of the unbeatable exhibition design trends in Dubai having a modern look & feel. Curved stands add a unique and sophisticated feel to your exhibition stand designs. Softening the look of your stand is the current exhibition design trend in Dubai. A curved aspect is more inviting, stands out from the other straight lines and angular stands. One can also utilize the curved effect for creating a series of smaller pods, instead of one large stand. This looks more welcoming to potential customers. It also develops an intimate feeling, making personal interactions with potential customers. These days best color for exhibition stands in Dubai is blue. Blue is more alluring than black, retains a sophisticated and smart feel. The technological edge has brought a lot of amazing tools and gadgets; however it also brought pollution and danger to the environment. That is why today more and more exhibition companies in Dubai are becoming “greener” in terms of production processes, end products, even materials they use for advertisement and other brand’s support tools. Participation in industrial exhibitions and trade shows is a great marketing tool for brands’ image building, announcement of new products, networking with other market players, new consumers’ attraction and loyalty building with current ones. Reusable materials have become new exhibition design trend in Dubai. Dubai based exhibition companies are choosing modular components, which can be put together in different ways. Dubai exhibition booth stands & trade shows are moving more and more towards complete sustainability in 2017. Sustainable exhibition stands are a key part of Exhibition design trends in Dubai. Exhibition Stand Contractors carefully consider how you can use your stand again in the future. Low-energy lighting. Using lower energy consuming components for stands is new Exhibition Design Trend in Dubai. For example, instead of using heavy powerful lightning, they can use low-energy lightning and combine it with light-dispersing fabrics. Green giveaway branded products. Instead of producing branded pens, notepads and other things destined for the dust, Dubai based exhibition companies have started thinking about more eco-friendly presents to your visitors like: re-usable products, online presents or discounts for your products. Events & Exhibition industry in Dubai has transformed greatly. Earlier exhibitions were used as a traditional mode for promotion of goods and services, but today it has taken a different route and has become company’s first choice in promoting its products or services. Projection mapping essentially allows you to project any image on to any irregular shaped surface or object. While LED displays can be used to create truly dramatic effects, though the scale and shape of the surface you wish to project from LED displays are more restrictive than with projection mapping. In order to promote displays in a dynamic fashion for drawing visitor attention, Dubai Exhibition Companies have started using LED lighting to change the look of exhibition space completely throughout the day. LED lightboxes & programmable LEDs can be employed to change color, or even animate, when someone is nearby. Latest lighting techniques among Dubai based exhibition agencies include lights whose colors can be changed without using gels. Using these improved lighting techniques in your exhibition booth stands can make your exhibits stand apart from others. Dubai exhibitors use bright lights at the exhibition booth stands conveying a sense of energy & movement. Dim, soothing lighting conveys that the visitor can discuss business in a relaxed atmosphere. They light up the exterior of exhibition stand with bright lights and also use soothing lighting in the meeting rooms. Bright spot lights accentuates all the details of the products. Shadow lighting as a exhibition design trend in Dubai is used to create a mystery about premier products. This effect enhances the curiosity levels of the visitors. There have been great technological advances in graphic manufacturing over the last couple of years. Large scale fabric graphics have become far more affordable offering a practical solution to create flawless graphic displays without the need for adhesive, nails, pins or specialist application. As you attend exhibitions & trade shows in year 2017, keep an eye out for hanging box banners, canopy’s and displays made from Tension fabric graphics. Using an aluminium frame, the fabric is held taut leaving a flawless effect with no danger of creases. Moving away from product logos & shots, booth visuals are getting increasingly lifestyle-focused. Fabric is one of the most popular exhibition design trend being followed in Dubai because it is lightweight and can be molded into various attractive shapes. Other common materials include wood and metal. Metal is not easily damaged and is therefore cost-effective because it can be used over many years for many exhibitions. Promo Events, one of the leading exhibition companies in Dubai is considered as a specialist in offering a wide assortment of Wooden Design Floor- Floor Master. These wooden floors are mostly used in offices, residence, showrooms and budget hotels. Plastic has formed a large part of various exhibition designs trends in Dubai replacing more traditional timber and metal framework means to create large stand out elements of the display itself. Modern plastics are also sturdy and strong, a reason why they are good to use. To really make an impact in 2017, gamifying exhibition booth stands is one of the most modern exhibition design trends in Dubai. Gamification entails using game design elements in a non-game context & applying these to your event. Dubai Exhibition companies use gamification tactically to encourage actions such as early registration and networking. For example: You can tap into people’s desire for better access and status amongst their peer group, by awarding in app rewards for those who actively network. They also create a touch screen game, such as a puzzle that reveals the company’s newest product or a quiz about the company. This way you build awareness, impart useful information and let people have fun at the same time. Using an i-beacon can make your stand a hot spot, with people receiving exclusive discounts and content. Once you have created a buzz and attracted a significant amount of attention, you’ll be able to document this for your own social media promotion or use at future fixtures. Beacons don’t mean big flashing lights. Beacons are all about subtlety. Using Bluetooth Low Energy, beacons allow us to broadcast advertising messages to any smartphone with a synced app. It’s a great way to encourage visits & push engagement by offering unique content. That’s why Dubai exhibitors are preferring this technology & it has become new exhibition design trend in Dubai. iBeacon technology delivers virtual invitations to the people with whom you want to get connected. This helps you to avoid time wasters and improve efficiency.